Organic chemistry is a leading reason students avoid STEM careers – from medicine to bioengineering to genetics. In fact, at UC Berkeley, organic chemistry has twice the fail rate compared to other courses. This problem especially impacts underrepresented minority and low-income students who may not be able to afford textbooks or tutors. It is no wonder underrepresented minority students are 25% more likely to fail chemistry at UC Berkeley. Many students have difficulty memorizing confusing molecules and organic chemistry reactions. As UC Berkeley chemistry tutors, we have helped many confused students by approaching chemistry problem-solving as a game. Since then, we’ve seen hundreds of students gain confidence as they solve organic chemistry problems. That is why we created React!™. React!™ is a revolutionary multiplayer game that can help anyone learn college-level organic chemistry. It is made for students, by students. Players buy and trade chemicals, discover and perform reactions, and create special molecules. React!™ makes learning organic chemistry fun by turning it into a challenging, yet rewarding puzzle instead of having to memorize confusing facts. 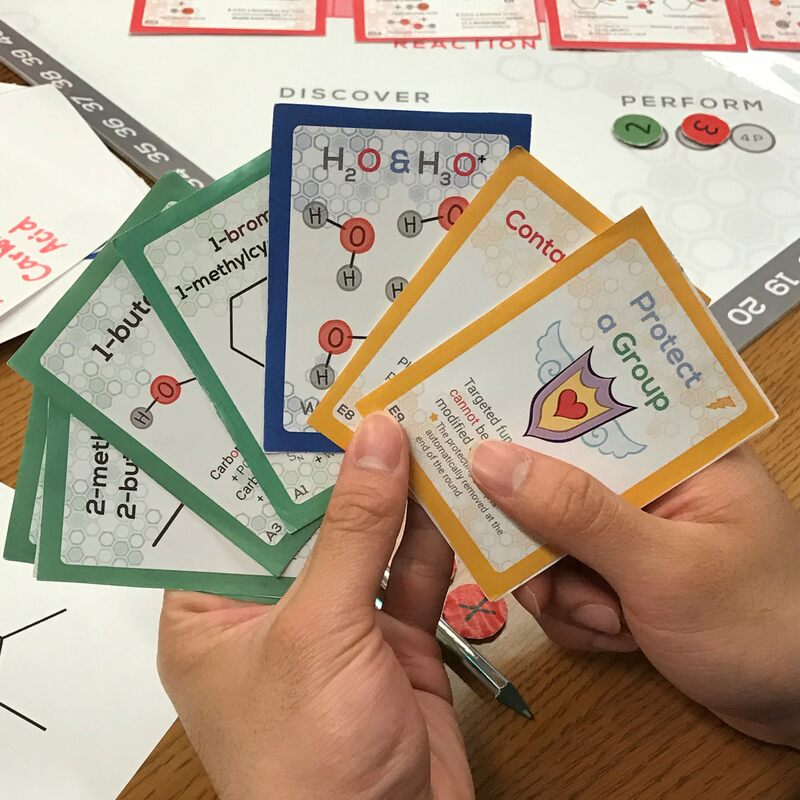 The game helps level the academic playing field and empowers students to think critically about organic chemistry by making it hands-on, easy-to-understand and entertaining. Our mission is to provide high-quality, affordable education to all students. Your gift will make a tangible difference for hundreds of local students. Like every reaction, there is a barrier to get started. Ours is manufacturing costs. Our goal is to donate 200 React!™ games to universities and high schools across California. With your help, we can get these games out to students at large. Your contribution will enable us to make high-quality education accessible, affordable, and fun! Please make your tax-deductible donation here. Thank you for supporting our mission! 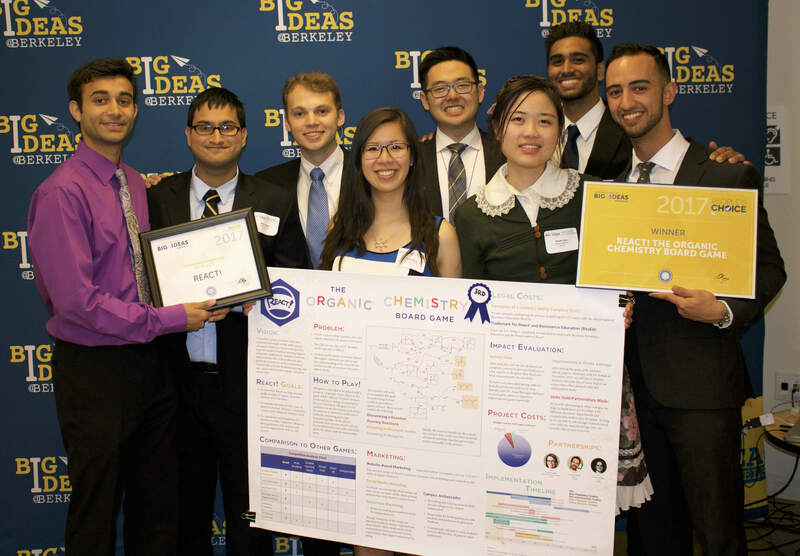 Out of 320 international submissions, business leaders chose React!™ as one of three winners for Improving Student Life in the Big Ideas 2017 startup competition, UC Berkeley’s global entrepreneurship contest. Our marketing video was voted first place in the Big Ideas 2017 People’s Choice Video Contest. React!™ has also had national media attention, including Chemical & Engineering News, local Bay Area ABC7 News, and American Chemical Society magazines. In our successful Kickstarter campaign, we sold nearly 400 games in over 20 countries and 30 states. 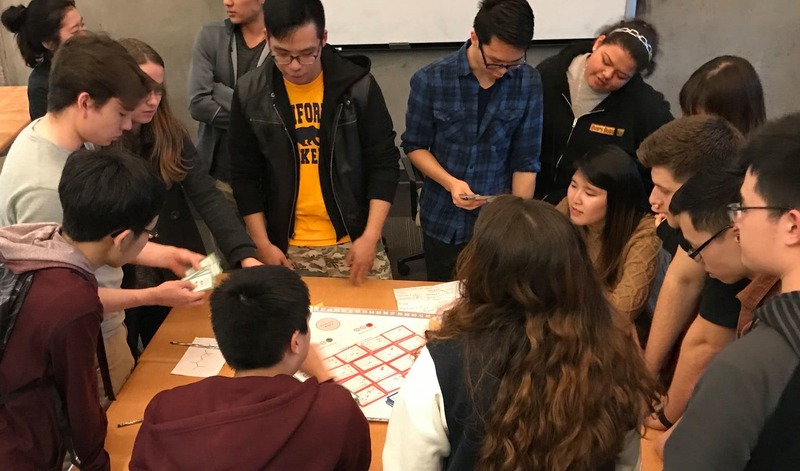 Our game is also endorsed by UC Berkeley Chemistry professors and faculty: Director of Undergraduate Chemistry, Dr. Anne Baranger; and Organic Chemistry professors, Drs. Pete Marsden and MaryAnn Robak. Our React!™ digital wallpaper is yours. We will also give you a shout-out on social media. Thank you for supporting our mission! THANK YOU! Your donation will provide a React!™ game for a school in California. After you have made your donation, please email ochemboardgame@gmail.com with your name and the address of the school to which you suggest a donation. We'll send you a personalized, handwritten thank-you note, a React!™ pin, and the $25 donation prizes for your generous contribution! All donors of this level will receive a high-definition PDF poster featuring the amazing artwork in our game, and all of the perks from the lower levels! You will be honored on our website under our donors section, "Catalysts", and receive all perks associated with lower donation levels. You'll be invited to a LIVE video Q&A session with the team! You will also receive all the perks from the lower levels.